A school's annual beach day has been scrapped over concerns about the dangers of midday sunshine. 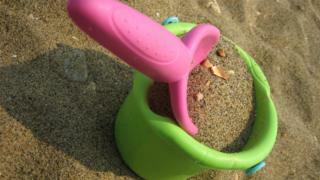 More than 200 pupils at St George's Preparatory School in Jersey were due to have a day at the beach in July. But after hearing a health department warning about skin cancer on the island, headmaster Colin Moore said the school would be organising "a less exposed alternative event". Mr Moore said "the children's health must take priority". He said the decision was made with "considerable regret". "I'm not suggesting we shouldn't go to the beach... but I think there is a big difference between taking your family to the beach and 210 or 220 children." He said the school may "resurrect" its visit to the beach in future years if adequate shading is available. The average Jersey temperature in July is 14C to 20C, compared with 11C to 19C in the UK, according to the Met Office. Too much sunshine was also blamed for the closure of an outdoor swimming pool in Cornwall because lifeguards were unable to clearly see the bottom of the pool after the weather helped create an algal bloom.